Bipolar disorder is the most complex psychiatric disorder with different types of mood episodes, subtypes, varied course, and significant co-morbidity. Not surprisingly, this complexity poses unique challenges to clinicians for optimal management of those with bipolar disorder. There has been an explosion of research into the causes and treatment of this condition over the past two decades. It is a daunting task for a practising clinician to make sense of this research and to remain up to date with progress in the understanding of the neurobiology and treatment of bipolar disorder. This book synthesizes and translates the vast array of research knowledge into information that is clinically relevant and meaningful for a clinician. 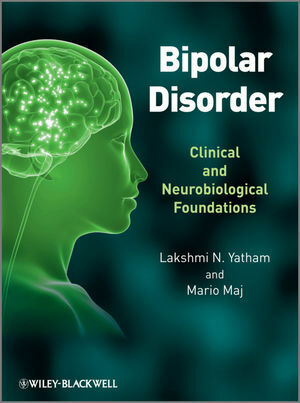 The book provides a comprehensive, yet focused, reference work on bipolar disorder for both trainees and practising psychiatrists. The two editors are leaders in the field who have published extensively on bipolar disorder. They have assembled a team of experts from around the world: in many instances, chapters are co-authored by people from different continents, bringing a truly international perspective to this important topic. The book covers the basic science of the pathology underlying bipolar disorder but addresses the clinical aspects of the disease throughout. Descriptive Aspects—issues ranging from how the concept of bipolar disorder has evolved over the years to new information about neurocognitive impairment, creativity and economic productivity, and to discussion of the deliberations of the DSM-V committee on changes in diagnostic categories and criteria. Biology—the contribution of genes to this disorder, changes in circadian rhythms, what we know about brain changes and the role of oxidative stress. Biological Treatment and Psychosocial Treatment— all the latest information about pharmacological and psychological treatments and the optimal management of this condition. If you want to provide state-of-the-art care to your bipolar patients, be sure to consult this authoritative reference. Dr. Yatham leads a Canadian consortium on bipolar disorder, testing new treatments for bipolar disorder using pragmatic and controlled trials with substantial funding from the Canadian Institutes of Health Research. He co-led the development of the Canadian guidelines for treatment of bipolar disorder in 1997; revised the guidelines for 2005 which were published with International Commentaries in Bipolar Disorders Journal. Dr Yatham is Chair of the bipolar group of the Canadian Network for Mood and Anxiety Treatments ; actively involved at a national and international level in continuing medical education and public education on diagnosis and treatment of bipolar disorder for psychiatrists, family physicians, and the general public. Currently the President for the International Society for Bipolar Disorders and on the editorial boards of a number of journals including Bipolar Disorders, Brain Pharmacology, Human Psychopharmacology, Quarterly Journal of Mental Health. He has published over 140 papers in peer-reviewed international journals and presented his research work at numerous international conferences. He was a recipient of the Michael Smith Foundation Senior Scholar Award (2001). Professor Maj is President of the World Psychiatric Association; President of the Italian Psychiatric Association (since 2000); President of the Italian Society of Biological Psychiatry (since 1990); Association of European Psychiatrists Secretary-General (2001-2002) and President (2003-4); Editor of World Psychiatry and member of the Editorial Board of several scientific journals. 1 From Mania to Bipolar Disorder (David Healy). 2 Clinical Features and Subtypes of Bipolar Disorder (Fred K. Goodwin and D.Z. Lieberman). 3 The Long-Term Course and Clinical Management of Bipolar I and Bipolar II Disorders (Lewis L. Judd and Pamela J. Schettler). 4 Comorbidity in Bipolar Disorder: A Focus on Addiction and Anxiety Disorders (Mark A. Frye and Giulio Perugi). 5 DSM-V Perspectives on Classification of Bipolar Disorder (Jan Fawcett). 6 Update on the Epidemiology of Bipolar Disorder (Kathleen R. Merikangas and Tracy L. Peters). 7 Suicide and Bipolar Disorder (Zoltan Rihmer and Jan Fawcett). 8 Neurocognition in Bipolar Disorder (Ivan J. Torres and Gin S. Malhi). 9 The Genius-Insanity Debate: Focus on Bipolarity, Temperament, Creativity and Leadership (Hagop S. Akiskal and Kareen K. Akiskal). 10 Economics of Bipolar Disorder (R. Sabes-Figuera, D. Razzouk and Paul E. McCrone). 11 An Introduction to the Neurobiology of Bipolar Illness Onset, Recurrence and Progression (Robert M. Post and Marcia Kauer-Sant.Anna). 12 Genetics of Bipolar Disorder (Falk W. Lohoff and Wade H. Berrettini). 13 Structural Brain Imaging in Bipolar Disorder (Paolo Brambilla and Jair C. Soares). 14 Functional Magnetic Resonance Imaging, Diffusion Tensor Imaging, and Magnetic Resonance Spectroscopy in Bipolar Disorder (In Kyoon Lyoo and Perry F. Renshaw). 15 Functional Brain Imaging Studies in Bipolar Disorder: Focus on Cerebral Metabolism and Blood Flow (John O. Brooks III, Po W. Wang and Terence A. Ketter). 16 Neurotransmitter Systems in Bipolar Disorder (Marina Nakic, John H. Krystal and Zubin Bhagwagar). 17 Molecular Biology of Bipolar Disorder (Ana Andreazza, Jun Feng Wang and Trevor Young). 18 Mitochondrial Dysfunction and Oxidative Stress (Tadafumi Kato, Flavio Kapczinski and Michael Berk). 19 Neuroendocrinology of Bipolar Illness (Timothy Dinan and Michael Bauer). 20 Circadian Rhythms and Sleep in Bipolar Disorder (Greg Murray and Allison Harvey). 21 Treatment Adherence in Bipolar Disorder (Jan Scott and Mary Jane Tacchi). 22 Acute Mania (Paul E. Keck, Jr, Susan L. McElroy and John M. Hawkins). 23 Pharmacological Treatment of Bipolar Depression (Allan H. Young and Charles B. Nemeroff). 24 Practical Pharmacological Maintenance Treatment of Bipolar Disorder (Alan C. Swann). 25 Rapid Cycling Bipolar Disorder: Phenomenology and Treatment (Joseph F. Goldberg and Michael Berk). 26 Management of Bipolar II Disorder (Gordon Parker and Terence A. Ketter). 27 Management of Comorbidity in Bipolar Disorder (Ihsan M. Salloum, Luca Pani and Tiffany Cooke). 28 Bipolar Disorder and Safety Monitoring for Clinicians: A Review of the Evidence and the Implications (Chris J. Bushe and Mauricio Tohen). 29 Somatic Treatments for Bipolar Disorder: ECT, VNS and TMS (Mark S. George). 30 Novel Therapeutic Strategies for Bipolar Disorder (Rodrigo Machado-Vieira, Husseini K. Manji and Carlos A. Zarate Jr). 31 Psychoeducation as a Core Element of Psychological Approaches for Bipolar Disorders (Francesc Colom and Lesley Berk). 32 Cognitive-Behavioural Therapy for Bipolar Disorder (Sagar V. Parikh and Jan Scott). 33 Interpersonal and Social Rhythm Therapy for Bipolar Disorder (Holly A. Swartz, Ellen Frank, Laura E. Zajac and David J. Kupfer). 34 Family Therapy Approaches to Bipolar Disorder (David J. Miklowitz). 35 Collaborative Care for Bipolar Disorder (Amy M. Kilbourne, David E. Goodrich and Mark S. Bauer). 36 Bipolar Disorder in Women (Benicio N. Frey, Karine A. Macritchie, Claudio N. Soares and Meir Steiner). 37 Phenomenology and Treatment of Bipolar I Disorder in Children: A Critical Review (Gabrielle A. Carlson and Elizabeth B. Weller). 38 Bipolar Disorder in the Elderly (Martha Sajatovic and Lars Vedel Kessing).